Canadian football—with 12 men to a side, longer and wider fields, and the single point for touchbacks—is feasible within technology available to Madden NFL's developers. Back in April, I was told that some developers once built a working CFL game internally, with uniforms and helmets skinned using NCAA Football's TeamBuilder tools. I told this to their Canadian-born boss, Cam Weber, the general manager of EA Sports' American football division, and asked him if he knew what his employees had done on company time. He was honestly surprised. "No, I did not know they did that," Weber said, laughing. "You know, the funny thing is, right after I joined (in February 2011) I got a lot of those comments, being a Canadian," said Weber. "You know, 'Hey, I guess we'll be making a CFL game.'" "I actually have had multiple conversations with Mark Cohon, the commissioner of the CFL," Weber said. "That league has been doing some great things, and it is growing in popularity in Canada. 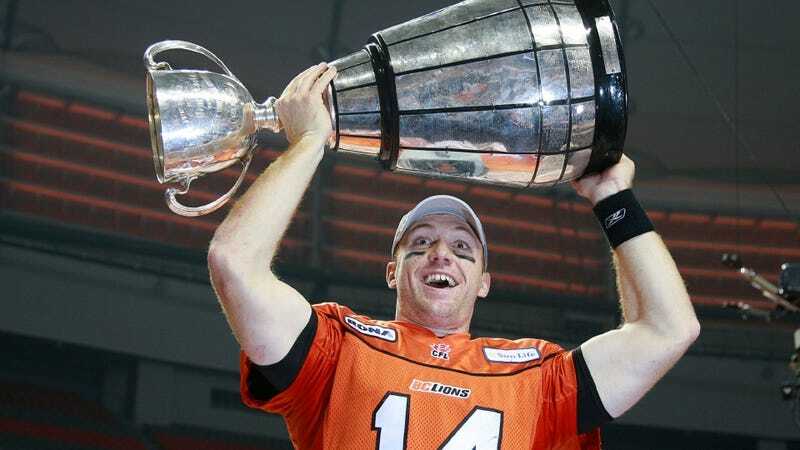 "I'm a fan of the league, I have been my whole life, but we certainly don't have any plans for a CFL game." The tinkering and hint-dropping hasn't stopped there. Much was made, back in January, of a visual Easter egg in NFL Blitz, another title Weber oversees. The game's "Zombie" team wears a uniform with a Mutant League Football collar logo. Is this a clue to fans or a nudge to the boss? What the Hell is Mutant League Football Doing in NFL Blitz? "There's nothing going on with Mutant League Football," Weber said, starting to laugh again. "Although, much like the CFL, I have had many people come into my office and say, 'You know, I really would love to work on a Mutant League Football game.' But no, we are not investing in Mutant League Football right now. "If it isn't crystal clear already, we are investing heavily in Madden and NCAA Football. Our goal is to make those games world-class, and innovate on a grand scale. Maybe sometime when we're on the top of the mountain we'll look at that stuff."